We can take care of any of your fountain dreams. Since 1978, H2O technologies has been Southern California's leader in high-end commercial and residential water fountains, water features, including ponds, lakes and streams. State of the art replacement parts and equipment. We work hard to turn your fountain dreams into reality. 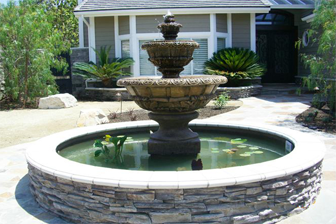 Our custom designs will help home and business owners enjoy beautiful fountains and water systems. We can take care of any of your fountain needs. Whether your fountain is simple and elegant or complex and extraordinary, H2O technologies knows how to keep your fountain looking its best. H2o technologies, offers a list of fountain options ranging from basic parts and equipment like pumps and filters to fully self-contained fountain units. H2o technologies, design and engineering staff understands the importance of selecting the best possible equipment for your project. When many people think about having a new fountain in added to their home or commercial property, they assume this involves starting from square one and building from the ground up; even if an existing concrete pool or old fountain is already in place. H2o technologies, offers a more practical alternative, an existing fountain or pool remodel using high quality pre-engineered equipment and effects to re-vitalize the structure. H2o technologies can offer a full line of pre-engineered, self-contained, fountain equipment modules. These modules utilize submersible pumps, and require no below grade piping. Just drop into place, secure, and provide electrical service. These modules make renovating existing fountains a reality and not just a dream.